Live streaming/streamed now -- would be nice to have commentary for 25kyu StarCraft audiences. Then AlphaStar trained for another week and won (pre-broadcast) 5-0 against top ten pro with the human get to play his specialty race, but in a live game match human exploit the AI weakness and it lose in such a AI style of loss. It should be note that in 10 pre-broadcast games AI can see all of the maps that it's legally allowed to see by the rule of the game, but in a live game it can only see locally just like human and have to move camera around to see and take action at another part of the map. Knowing DeepMind's formula, they will turn this single loss in their (almost) perfect record into a crazy version like AlphaGo Master for sure. From Reddit AMA look like Fan Hui is still working at DeepMind? "We have met with Fan Hui. It was a fun experience to see how we had a similar approach, confidence, going into the matches. We talked briefly after the event and we both felt excited about where this journey is going to take us. Even though we are from two different worlds - Starcraft and GO, our competitive side felt very similar. 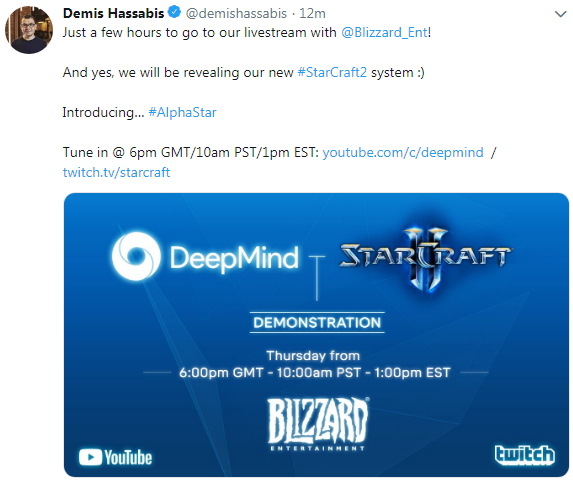 It was a pleasure to talk to him and to the Deepmind team responsible for playing AlphaStar." Is it only me or the sound doesn't match?